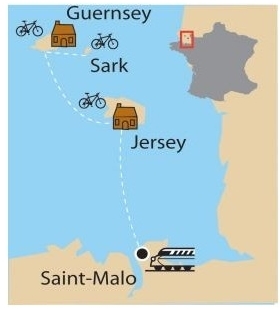 This discovery by bike of these 3 islands is a total escape, only 1 hour of crossing from Saint Malo. Jersey is discreetly charming like an Eden garden laid on the waves. Guernsey has kept its British origins as well as the steep paved streets of its capital. Arrive in SAINT MALO early in the morning. Embark for a short 1h10 ferry crossing to Jersey. Installation at the hotel in the town center of Saint Hélier. Jersey western part discovery with stunning views. 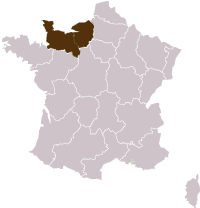 Saint Aubin port, 8km long Saint Ouen Bay, the Manor House and Gronez Castle. Discover the hinterland and the ancient pirate and smugglers Sanctuary. This ride is punctuated with typical Manor Houses, thatched roof cottages and splendid views over the Continent. Today in the morning take the boat to Guernsey.Installation at the hotel in St-Peter-Port. Ride from St Peter at Pleinmont Point along the coastline . Discover the Southern Coast of Guernsey and get back by the peaceful roads. Night in St-Peter. Walk to the pier to take the boat to Sark (50 mn) and spend the day in the wildest island of the archipelago. Cars are forbidden on the island, the bike is therefore the best way to explore the island. Back to Guernesey to spend the night in St-Peter. Free time in the morning to walk on the footsteps of Victor Hugo and back to Saint Malo in the afternoon. The trip to St Malo. All lunches. Drinks. Visits. Travel insurance.